(0 Customer Reviews) | Write Review 4 issues per year Devoted exclusively to underground culture: reviews of zines, books, websites, videos, music, articles from the alternative press, interviews, original fiction, and commentary on independent arts. Seed bombs, radical planting, clandestine crops — the guerrilla gardening movement brings greenery to unexpected corners of the condo-topia. Find out how to get on board! Plus: Our spring cut-out special, featuring the Papercut Comics Toolkit and Staple Stanley, your new fold-up best friend; Indigenous zine-making philosophy; Spring Indie Book Previews and, as always, tons of excerpts and reviews from indie publishing and the underground zine scene. Devoted exclusively to underground culture: reviews of zines, books, websites, videos, music, articles from the alternative press, interviews, original fiction, and commentary on independent arts. 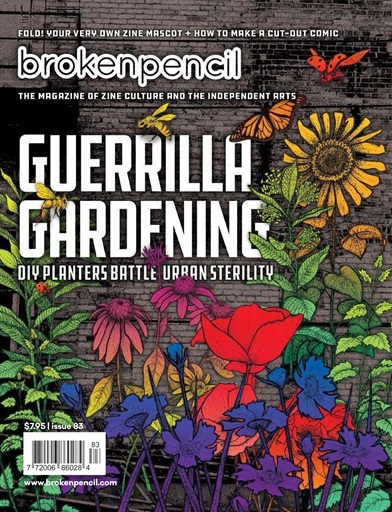 You'll receive 4 issues during a 1 year Broken Pencil magazine subscription. You'll receive 4 issues during a 1 year Broken Pencil magazine print subscription. 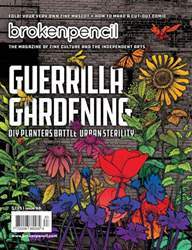 Broken Pencil 80: X-Ray Summer Reading Issue!